Since 1989 ProMed has been a leading force in the art and science of medical molding to address an industry need for cleanroom molding of silicone components and assemblies. With our primary focus to manufacture components, which have medical applications which are short-term and long-term implantable, that are intricately designed silicone and plastic components. Our innovative processes include molding of components and automated assembly, including assembly of complete devices. Over the years, we have evolved into a full-service provider of molded parts and assembled products, including molded silicone components, bio-material grade plastic components, combination components (incorporating pharmaceuticals) and value added assemblies. We utilize state-of-the art technology, draw from an experienced technical community, and take a creative systematic approach to provide you with a dependable, high-quality and overall cost-effective solution to your manufacturing needs. ProMed has the resources,quality systems and facilities to meet most dimensional and cosmetic print specifications and comply with rigorous industry standards. ProMed has garnered the reputation as the world’s benchmark for molded components and assemblies-and is one of a handful of companies in the world to provide contract manufacturing of drug-eluting products. Facilities are in Minneapolis, MN and Dorado, Puerto Rico with a total of 97,000 square feet of manufacturing space and approximately 200 employees. Our innovative processes range from simply molding components to automated assembly to providing complete devices. We utilize state-of-the art technology, draw from an experienced technical community, and take a creative systematic approach to provide you with a dependable, high-quality and overall cost effective solution to your manufacturing needs. Over the years, we have evolved into a full-service provider of molded parts and assembled products, including molded silicone components, biomaterial grade plastic components, combination components (pharmaceuticals into silicone) and value added assemblies. Through multiple media platforms, ProMed’s collaborative Design for Manufacturability (DFM) meetings include a diverse group of engineering experience that work to provide you with the best path that will meet your requirements, budget and timeline. ProMed has expertise in working with the full spectrum of silicones covering a wide range of properties and characteristics. We will assist in your material selection to help ensure all design requirements are met. Our wide range of materials include: Liquid Silicone Rubber (LSR) 5 to 80 Durometer, High-consistency Rubber (HCR): 20 to 80 Durometer, Room Temperature Vulcanizing silicone (RTV). As a leading contract manufacturer of polymer-based drug releasing molded dosage forms and combination device components, we have the experience and advancing technology to manage your product range. Working with both established and early-stage medical device and pharmaceutical companies, ProMed develops robust manufacturing processes and platforms for extended drug release from a variety of materials, including silicones and thermoplastics. Customers get products developed, launched, and released to market faster and for less cost than their competition. Our team of prototyping experts offers complete in-house mold design, mold build, and prototype component manufacturing. From Medical and Pharmaceutical to Aerospace, ProMed has the ability to easily handle Micro/Nano parts and in general anything within a 8″ x 8″ x 6″ cube. ...thanks for the continuous, excellent customer service you provide us with! The parts we have assembled into full units have been performing very well! Nice work. Thanks. ProMed Pharma is the turnkey manufacturer of our flagship urology implantable medical device. 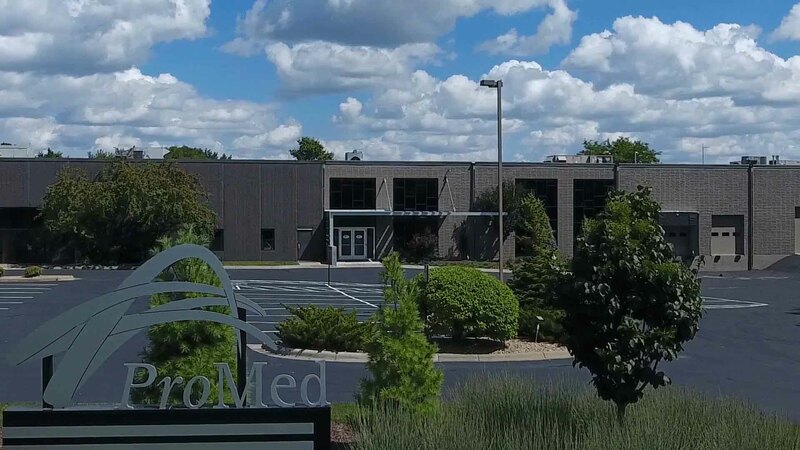 ProMed combines world-class manufacturing facilities, quality systems and supply chain management to provide us with devices that transform the lives of patients around the world. I unconditionally recommend ProMed as a manufacturing partner, based both on our ongoing collaborations and more importantly the experiences that surgeons and their patients have every day with the devices manufactured by ProMed. Thank you for all your hard work and support working through the insert issue on the hot jaw. Your scheduling flexibility, and willingness to ship parts daily, has kept our manufacturing line from shutting down. You've gone above and beyond the call of duty and we thank you very, very, much! ProMed’s New Product Development (NPD) process is second to none. We use it as a benchmark to evaluate all other suppliers. Thanks for working with us to keep making the product better, I really like working with ProMed! ProMed has been a critical supplier to our company for the 12 years that I have been the Supply Chain Manager. In that period, I have personally participated in several quality audits and some tooling projects. ProMed has always displayed a high level of competence in their core competency of silicone molding and is recognized as a high-quality supplier to use. ProMed has garnered the reputation as the world’s benchmark for molded components and assemblies – and is one of a handful of companies in the world to provide contract manufacturing of drug-eluting products. Here are some of the awards we won for our products, services and dedication to work-life balance. ProMed is honored to have been chosen as Manufacturer of the Year by Manufacturers Alliance. This award recognizes companies that share information and continuous improvement experiences to strengthen the local manufacturing community. ProMed is the 2014 win ner of MRA’s Human Resource Excellence Award. This award honors a member organization that improves the work life, well-being or productivity of their employees and/or their business overall. Hennepin County recognizes local companies for successful employee health promotion efforts with the Wellness by Design Award. ProMed received the Gold award in 2011 and 2012 and the Platinum award in 2013. ProMed has been awarded Best Supplier of Mechanical Parts by Sorin Group, in a unanimous decision by R&D, logistics, quality, and purchasing teams. We are honored to be recognized for our commitment to quality and customer support.